Let peace become you. Let your heart flower. Let peace be the things you do from your first breath to your last breath. Let peace become your life. Drown yourself in it! Peace calls up beauty like fire. Peace like the sun. Peace that consumes a life and speak in the voice of doves. Peace as your own heaven. Peace that walk together with you. Peace that walk colour blind. Peace that walk with humanity and nothing else. Peace that walk as human and all minds laugh. All hearts flower. All souls sing together. All souls become peace. All souls become beauty. I heard silence like the market place and the voice of a river. I saw the spirit of a singer dancing wild. I heard a voice that unearths a sanctuary within and captured wholeness that became me. An unbroken wholeness like an atom. My soul was staring at the moon. The morning was bleached. Then a seed became tomorrow and everything was peace. Here is everything. 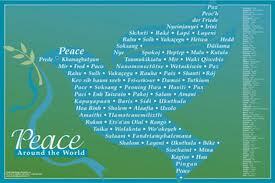 To spread peace and communal harmony in the world. 1) To spread peace globally by making people come to common terms and to the oneness of God almighty. 2) To fight war, injustice, armaments, discrimination, terrorism and cruelty through every means. 3) To fight, war, terrorism & try to eliminate it through preaching and intellectual force. 4) To focus on social issues and encourage co-operation among fellow citizens in order to bring about peace in the society. 5) To educate for peace in schools, communities, nationally and internationally..
7) To deliver and participate in public talks, conferences, seminars and workshops, locally, nationally and internationally. 8)To distribute Peace literature amongst the people to bring them to common grounds of understanding about a culture of peace and active non-violence and hence promote communal harmony. 9) To use Media (Internet, News, Video & Audio) as one of the most powerful modes to deliver the message of peace to the entire mankind. GROWINTOPEACE Short -Range Strategic Plan is envisioned as a living instrument of valuable skills and way of life. Program: The social and political changes, nationally and internationally, that we will strive to accomplish. Growth, Fund Raising and Coalition Building: How we will strengthen our social movement, in order to accomplish our program goals. Governance and Organizational Design: Ways in which we will better manage our growth and our activities as an organization. GROWINTOPEACE have made strides in propagating the message of Peace through neutral collaborative platforms, How to Live in Peace Talks, GROWINTOPEACE Clubs in schools, Peace conferences, seminars and community programs / workshop for women. Such platforms go a long way in educating for peace, active nonviolence, and in bringing communities together, building a culture of tolerance and social cohesion among community members. The main objective of the initiated community programs / workshop for women, is to afford women the opportunity to take a leading role in peace building , to bring people together and foster a culture of tolerance within communities. This strategic plan was shaped through responses to the needs of the society and our various projects and discussion among the facilitators. New challenges and opportunities that we cannot now envision may make it necessary to modify this plan. But, by establishing goals, identifying clear objectives, and outlining specific strategies for each, the plan provides the GROWINTOPEACE network the means to work together cohesively and effectively. We hope and expect that this plan will inform our work over the next five years and inspire us to work harder and smarter for peace. GROWINTOPEACE will be propagating the message of peace through peace gardens where community members from diverse backgrounds will meet and work in the gardens. Besides the economic gain derived from the garden, the peace gardens will offer a neutral platform for community members where they cement social relationships and foster a culture of tolerance among community members. Plant a Peace Tree Project will be propagating the message of peace through tree planting. GROWINTOPEACE PUBLICATIONS on Peace, Peace Education, Christianity, and Character education.